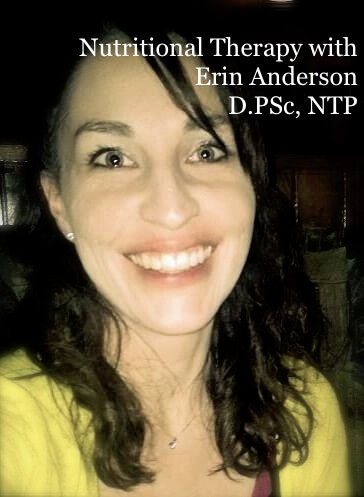 Erin Anderson is a Nutritional Therapy Practitioner and licensed Diplomat of Pastoral Science and Medicine. She was born in Australia and grew up there and in Asia before moving to the U.S. Before moving to rural Missouri, she was a city girl through and through. She and her husband enjoy their new laid back lifestyle while educating their young children about life in the country. Erin enjoys helping clients to find ways to support their health through a whole food nutrient dense diet. She has also previously worked as a weight loss counselor and group exercise instructor. In addition to nutritional counseling, she is also trained in giving Functional Evaluations and using Lingual-Neuro Testing. The Functional Evaluation involves a series of palpations and other clinical assessment tests. These were selected by the founders of the Nutritional Therapy Association following the research of a variety of functional medicine practitioners. This evaluation is not invasive or painful, however Erin does look for a tenderness rating for each reflex and palpation point. The Functional Evaluation is not used therapeutically. Rather, it is a tool used for assessment, to gather information. It allows the practitioner to use the innate wisdom of the body to show where it is experiencing distress/ imbalance and what it needs to be in balance. The second part of the Functional Evaluation involves Lingual-Neuro Testing (LNT). After using the series of simple physical indicators in the Functional Evaluation, Erin can perform a Lingual-Neuro test on certain reflex points/indicators. If the supplement/nutrient is beneficial, the point in question immediately changes in sensation. The LNT goes hand-in-hand with the Functional Evaluation. It is a special feedback mechanism based on the neurological response of how the tastebuds communicate with the brain and through the central nervous system. All together, the Functional Evaluation and Lingual-Neuro Testing, along with food journal review, nutritional health assessment analysis and detailed health history allow Erin to provide clients with well-guided recommendations for diet, nutrition and lifestyle. Erin enjoys running, hiking, singing and going on trips with her family for fun. She lives in the country and loves being surrounded by nature at every turn.